It’s always a terrific sign when a stable is prepared to stick with a stallion’s stock and Ellerton Zahra Racing has gone back to the market to secure another yearling by powerhouse sprinter DEEP FIELD. 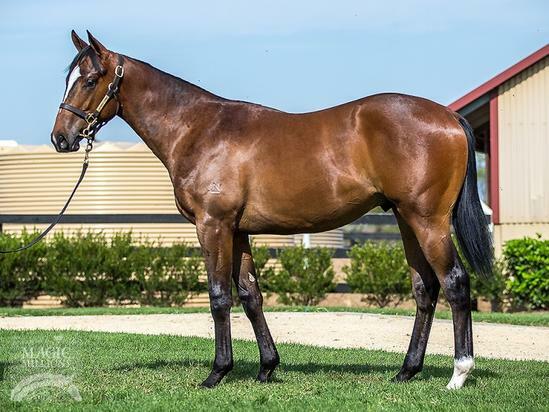 Trainers Mathew Ellerton and Simon Zahra bought three of DEEP FIELD’s progeny last year and wasted no time in adding another colt by the speed machine to their stable at the first yearling sale of 2019 on the Gold Coast. DEEP FIELD was simply brilliant during his racing career, smashing the Canterbury 1100m record and scoring at Group 2 level at only his fifth start but the young stallion has made an equally impressive start to his stud career. DEEP FIELD has already sired the stakes-placed Spaceboy while his son Hawker Hurricane won the $250,000 Magic Millions Clockwise Classic on debut at Ballarat. DEEP FIELD has also had Cosmic Force and Roman Wolf win in New South Wales to stamp their sire as a young stallion to follow in the coming seasons, which is no surprise when he has NORTHERN METEOR, ENCOSTA DE LAGO and ELUSIVE QUALITY featuring in his pedigree. This colt hails from family that simply produces winner after winner. He is the first foal out of the KEEPER mare In The Moment, who was a three-time winner over 1200m, and is out of the stakes-placed Autumn Moments. Autumn Moments produced nine winners from nine foals to race, including the Group 3 winner Autumn Jeuney while this colt is also closely related to the 14-time winner LITTLE BROWN HORSE and the Group 3-placed Crown Prosecutor, the winner of seven races. Purchased at Magic Millions Gold Cost sale for $80,000 - click.